With Brexit such a contentious issue, British Conservatives in Paris (BCiP) is publishing news of various kinds concerning Brexit negotiations and this report is from one of our members: Edward de Mesquita has given us permission to publish his text. The Conservative Group for Europe (CGE): Meeting at Westminster on Tuesday evening, 22nd November 2016. Report by Edward de Mesquita, BCiP member. The meeting was chaired by Sir Nicolas Soames MP and the guest speaker was Alistair Burt MP, who gave us a short résumé on the current status of negotiations for Brexit. We were informed that the EU Commissioners are resisting any UK discussions with individual countries and are putting pressure on member states not to negotiate with the UK individually but solely to handle the UK’s departure on a collective basis. (My impression was that this smacked of bullying by the Brussels Commissioners to take away the influence that any individual country may wish to exert.) We were informed that the Commission is very worried about the populism spreading around the world. As regards our negotiations so far, the Commissioners are discouraging any such talks until Article 50 is triggered. It is becoming apparent that they wish to give the UK a very hard time in order to discourage other member states from doing likewise. However, there is a new fear that if the other member states see the UK being punished for wishing to leave the EU, then this will give the impression that the EU is an institution that, once you are in, it will be near impossible to leave. The latter argument has not really taken hold yet but it is growing. Anna Soubry MP and former Business Minister, who was a committed ‘Remain’ campaigner before the Referendum, informed us that there is a constitutional hurdle looming whereby the devolved parliaments of Scotland and, Wales, etc. will have to pass their own respective legislation before Article 50 can be invoked. We were told that even if the Commons voted in favour of triggering Article 50, this decision is reversible. If the lawyers find the Scottish vote to be constitutionally obligatory, then when the Scottish Parliament votes against such legislation, which they clearly will, what happens next is anybody’s guess. There was also a representative from the House of Lords who informed us that the vast majority of Peers oppose Brexit. I was in a room with around thirty people, many of whom had spoken in fringe meetings on Brexit and its consequences at the Conference, so I knew quite a few of them. The CGE are a small group but very determined. There were all sorts of small business people including a lady who ran a farm in Wales and who depended on short term foreign labour for her harvest. When I spoke, I gave a few examples of the difficulties faced by small businesses like mine who rely on the freedom to go ‘shopping’ for imported European goods; I briefly cited other examples of small importers who rely on the freedoms of access to the single market. I pointed out that Jaguar-Range Rover and Nissan have attracted huge PR attention but there are literally millions of small businesses who would be devastated by import duties, delays in bonded warehouses and a mass of red tape, etc., who get no press attention whatever. These businesses represent a huge chunk of UK employers and our demise would mean the loss of millions of jobs and tax revenue. The CGE needs funding to promote the argument that the UK desperately needs to maintain its access to the European free market to safeguard millions of small enterprises who rely on quick and easy importing and exporting to run their businesses. Diplomacy must change to going up with the Sound of the Trump! I never thought that I would say this, but I have to admit that Donald Trump has now convinced me. The present conventions of diplomacy are wrong and must be changed. Which country is the more affected by the choice of an ambassador, the host country or the country sending the ambassador. The question clearly answers itself. The host country has to put up with his presence; the country he represents merely gets rid of him. Therefore, from now, it must be the host country who decides whom the ambassador shall be. So, if President-elect Trump wants Nigel Farage, he should have him; subject only to another country where his presence would be more appropriate, I have in mind North Korea, having the right of pre-emption. Think of the benefits this system could offer. Perhaps we could persuade Zimbabwe to demand Boris Johnson, or outer Mongolia David Davis. A left-wing English friend of mine says that Britain should claim Bernie Saunders as its American ambassador, my personal view is that most British, or perhaps I should say most British men, would prefer Scarlett Johansson. Of course the British would ask for Carlo Bruni from France, even if that meant them having to put up with Sarko coming with her. That would save money, as she could represent both France and Italy à la fois. Inevitably there would be some minor disadvantages; the UK would have to make it clear that neither of the Middleton sisters are permitted to reside outside Britain, and can anyone think of three famous Belgians whom other countries could seek? But such difficulties are made to be overcome. As someone has not quite said, the sound of the trump means the sound of the trump. Limited Edition Prints with EU Referendum Theme – offered by Rafael Pittman.
? 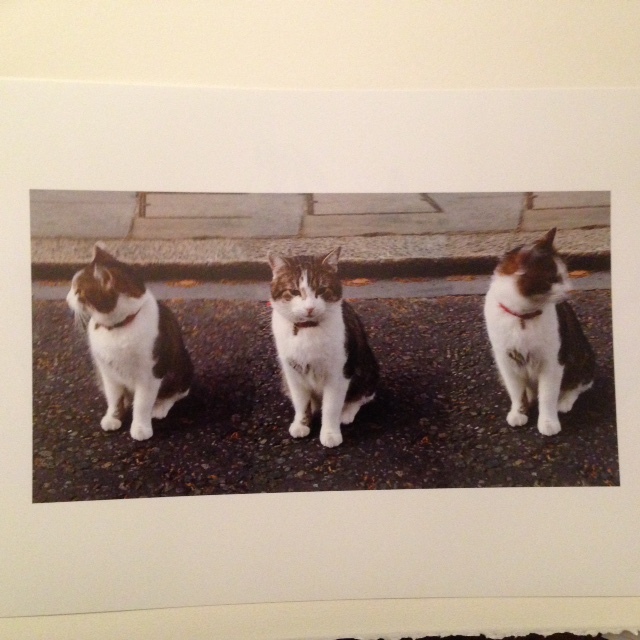 « Larry the Downing Street Cat » is an artist’s proof, giclee print of an original photograph tryptich taken in Downing Street in 2012 and captioned: Larry on the LookOut….or…..In. A framed print size 28 x 36 cm will be available for auction (?50 reserve price) at our Christmas party on the 10th December.
? 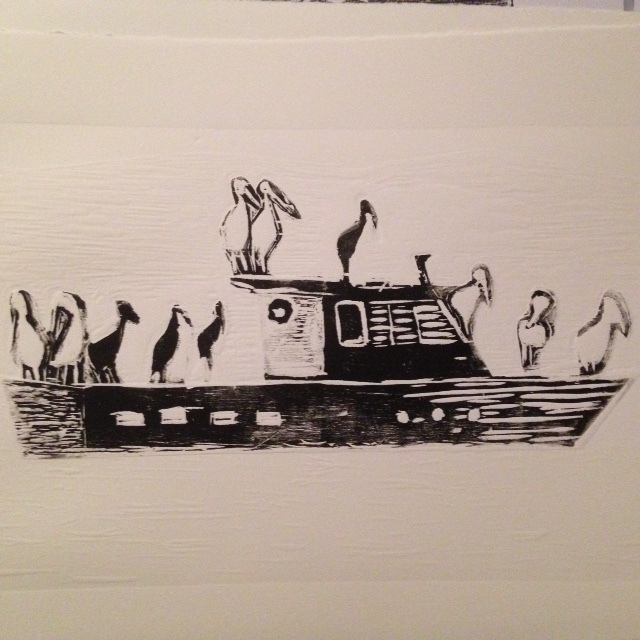 « Pelican EU » is a giclee print of an original woodcut « Pelican Boat » adapted for Conservatives Abroad as a commemorative EU referendum piece and captioned: Yes we Pelican. A limited edition of 10 only prints at ?50 each are available as advertised with image and can be bought or collected at our speaker dinner on 1st December or Christmas party on the 10th December. You can contact us here to find out more. You are currently browsing the British Conservatives in Paris Blog blog archives for novembre, 2016.